Okay, people of the Internets. I need your help. I’ve been offered by various family members a new notebook computer for my birthday, but I’m torn between two Apple offerings: the 15″ MacBook Pro and the 13″ MacBook. On one hand, I’m drooling over the lighter weight and smaller form factor of the 13″ MacBook and I’ve always thought that the MacBook Pro I have now was a bit overkill for me, at least when I got it (but at the time, it was the only Intel machine Apple offered). On the other hand, the graphics capabilities of the MacBook Pro are much better than its little sibling, and the higher screen real estate (which is what I’m used to now) would be useful when working with iPhoto and iMovie (two applications I’m using more and more). Now, since this is going to be a gift, cost is not technically a factor, but I’d prefer not to break my benefactors’ banks. So asking for a MacBook would be a kinder request. So what do you think? Please vote in my poll and help me decide. Thanks! This is a little more than just scrubbing the bathroom (and honestly, I don’t even do that; I have a housekeeper who does a much better job than I can do). I mean going through every nook, every cranny, and every pile of crap in my house and getting it all under control. Scanning in the kids’ art projects and sending the originals off to the grandmothers. Getting rid of the mementos I haven’t looked out (or taken out of boxes) in 4 years. Get my house into some sort of organized shape so that it doesn’t look like a FEMA zone all the time. A one off on this theme is to redo the basement into a kids playroom so that we can get most of the toys out of the living room (where we’re always tripping on them) and into a dedicated space that the kids can call their own. This includes laying down new flooring since the cats have ruined the carpet there. Another related part of this is to redo the floor in the kitchen. The original vinyl tiling that’s there has been peeling up since pretty much we bought the house and if we ever want to sell the place ourselves, that needs to be fixed up. It’s a big project, bigger than it sounds, and maybe I should call it more “organize my life”, but if I can tackle the clutter that I live in, it will be that much of an improvement in my life. I should probably add to that “ask for books as gifts”. I have a pile of books I’d love to read, but I simply don’t have the time. Why compound the problem with more books? In fact, I haven’t read a single book I received as a gift for Christmas 2007! So I really don’t need any more. I don’t need to buy them, and I don’t need to ask for them. I need to read what I’ve got. And the same goes for audiobooks. I recently bought one that I’ve only listened to the first 3 chapters of. I can’t listen to them in the car because no one else in my family wants to listen to them (and they’re almost always in the car with me, especially during the daily commute). I find it hard to listen at work because I can’t concentrate on the text and what I’m working on at the same time. So again, no time. Basically, both of these resolutions come down to setting priorities. I’m going to find the time to clean my house and read my books. I have no idea how I’m going to accomplish this and still get any sleep, but I have 365 days to figure that out. Melt the butter in a saucepan over low heat. Beat together butter and sugars in stand mixer with flat blade. Add egg, egg yolk, milk and vanilla; beat well. In separate bowl, combine flour, baking soda, cinnamon and salt. Add flour mixture slowly to batter; mix well. Stir in oats and raisins; mix well. Using ice cream scoop, drop batter onto cookie sheets lined with parchment paper. Chill in refrigerator for at least an hour. Bake 14-17 minutes in a 350°F oven. Cool 1 minute on cookie sheet; remove to wire rack. Makes 24 cookies. It’s been an exciting year for the Rottons. I subscribe to several news video podcasts (such as the NBC Nightly News) that I listen to at work. I subscribe to the video feeds because I like to have the video option available, although 90% of the time I’m content to just listen to it. And since this is at work (and I don’t keep an iPhone cable with me), I’m often concerned about exhausting the iPhone’s battery before the end of the day. Go to Settings > General > Home Button and check “iPod” under “Double-clicking the Home Button goes to:”. Also, set the slider for “iPod Controls” to “On”. Go into iPod mode of the iPhone, choose the video content you want to listen to and begin playback. Turn off the screen by clicking the power button on the top right of the iPhone. Audio and video playback will stop. Double-click the home button on the iPhone. The iPod controls will appear underneath the clock. Press the “Play” triangle. The background screen will change to the title screen of your video content, the audio will begin, but the video will not begin playing. Click the power button on the top right of your iPhone again. The audio will continue, but the screen will go dark. This will work for music videos as well as video podcasts. I’m presuming that it will also work for TV shows and movies, but I don’t have any content like that on my iPhone so I can’t test it. Unfortunately, once you go back into your iPhone (that is, move the unlock slider from left to right), the iPhone will immediately resume the video playback, and if you try to leave iPod mode to go do something else, the audio will cease again. (This stinks because I often need the calculator while working, and hate having to stop and start my podcasts all the time.) At least, however, this is a way to conserve some battery life when you really don’t need to see the video in your video podcast. I think Sasha’s “Flippy, the Wonder Baby” phase is finally over. For about three weeks, maybe longer, she felt compelled to flip to her tummy when put down on her back even the least bit awake. Once there, she’d start to fuss, and then scream because: A) she didn’t want to be on her tummy and B) she couldn’t flip herself back over. Once in the occassional while she’d finally manage to fall asleep on her tummy after fussing for a little while, but usually we’d have to flip her back after she worked herself into a tizzy. 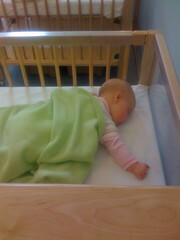 Fortunately, I think she’s over all this. She hasn’t tried to do the Flippy thing for several days now, and I think as a result we’re both getting a lot more sleep. 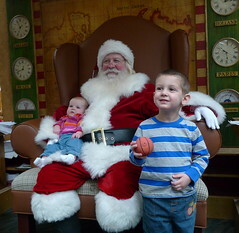 Sammy with his first cousin twice removed, Connie. Following @veronica‘s example, I’m posting the sixth photo on the sixth page of my Flickr photostream. 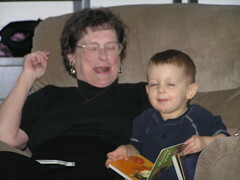 Here we see my mom’s cousin Connie with Sammy taken when she last visited us on January 21, 2007. Sadly, the focus on this picture is a bit off, but the look on Sammy’s face is priceless! We had a wonderful Thanksgiving with Grandmommy & Uncle Brian. After a delicious dinner on Thursday, we went for a nice walk at the C&O Canal on Friday. Saturday night we checked out the Garden of Lights display at Brookside Gardens.